Macramé, cane chairs, pot plants, Moroccan shag carpets and patterned fabrics are in. Grab a Mateus rosé, be bold. You may want to sit down before you carry on reading this piece. Ready? Here goes: macramé is back in fashion. There are now pages on Pinterest dedicated to the knotted form of textile, the super cool Ace Hotel chain features macramé wall hangings and Livingetc is starting to write about it. 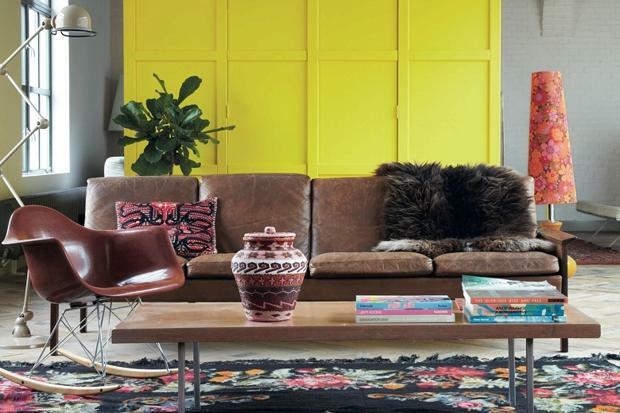 So it’s official — and its popularity is likely to receive a further boost with the recent publication of Bohemian Modern, a new book by the interiors stylist Emily Henson, who works for Ikea and the cult fashion shop Anthropologie. The Bohemian Modern look is a 21st-century take on the 1970s home, hence the macramé, accompanied by lots of house plants, cane chairs — ideally hanging from the ceiling — thick Moroccan carpets and bold patterned textiles. She travelled through Europe, Morocco and the US finding more modern bohemian homes to showcase in the book, ones with lots of pattern and colour, bold use of textiles and modern elements such as concrete floors and open-plan living spaces. “I know people are crazy for mid-century design and other eras, but I like to mix it up,” she says. ■Textiles play a large part in a bohemian modern home — whether colourful or more muted. Colour and pattern are important and they don’t have to be all bright with Henson advising starting with white or off-white walls and adding colour through cushions, rugs and tiling. ■Contrast: “It’s about mixing the true 1970s-inspired ideas with modern elements,” says Henson. “You can put a beautiful Moroccan rug on a polished concrete floor, for example.” Create interest in the home by balancing hard versus soft, old versus new, pattern versus plain. ■Green living: add indoor plants to your home, with terracotta pots sitting on the floor or hanging from a brightly coloured macramé plant hanger (which you can buy on Etse, as well as macramé wall hangings). ■Complete the vibe with a cane chair hanging from the ceiling, scattered with lots of patterned cushions.